Every player on the roster is driven to succeed. The ‘veteran’ Sabres strive to cast the doubt of last year back to the shadows of the past – the young players as well as those brought in have the spark to assert themselves; to grow, develop, adapt. While some are inspired by their dreams to play in the NHL, others are piqued by the swirling circumstances of good fortune the Moirai have assembled in Buffalo. Even Murray and Bylsma are prompted to advance the beauty on the ice. But motivation is not solely a reserved characteristic for those that entertain on a frictionless surface. Motivation rests, alas, also with me: the fan. With the abyss of successive seasons cast down to Hades’ underworld, I too am motivated, even invigorated by the upcoming season. I have seen the players struggle, entertain hardships, and form jovial friendships under difficult circumstances. Their work tosses them into partnerships with players that may not be around tomorrow. They know this; it’s the way of professional hockey. Yet they are inspiring, before even the first game. They meet the personal challenges of their work. Witness young players like Guhle, impressing with the Sisyphean task of making the team to Legwand and re-proving why he’s a legitimate NHL player. Those who wear the sweaters are heartening. And like them, fans have their own tribulations to overcome. Jobs, families, relationships (romantic and platonic) are just some of our struggles. And dare I remind that Western New Yorkers will soon be visited by the white struggle of snow…but I digress. We grapple with our jobs. The struggle of man versus machine happens to be very real to many of us. Are we to be replaced by a computer? Even then there’s always the very nature of work – a.k.a the boss and its bottom line – do we make too much? Is a kid fresh out of college going to take my position for cheaper? Am I achieving or even exceeding expectations from my employer? We also must contend with our worst enemy: ourselves. Man vs self. Do I make enough to raise a family, buy a car, travel to a Canadian Fishing Trip, take vacations (mentioned twice since it’s doubly important), save for retirement (unless the job is so good its not worth leaving), engage in hobbies (tix to Sabres’ games), save, buy a house? What are my goals in life? What makes me happy? What do I want out of life? What’s for breakfast? Will the Cubs ever win a World Series? What’s the answer to life if it isn’t 42? These are our collective thoughts; our companions for every game. The fighting is real. There aren’t 5-minute penalties in this life, though perhaps a couple game misconducts every once in a while. That 200-foot frozen pond isn’t just the stage for a beautiful dance; it’s also a reflection…a mirror back to the life of a singular fan. The beginning of the season, with its freshly Zambonied mirror of ice, is a tabula rasa of the spirit. A clean slate for us all to begin anew…Elysian Fields to frolic within. Grappling thoughts with doubt is broken by twelve men playing a beautiful game. Motivation in action, every game. All players on that roster and those that have been cut or reassigned have struggled all off-season just to have a glimpse of NHL play…just for a chance, however brief, to entertain us, motivate our lives, and perhaps spur us to action. 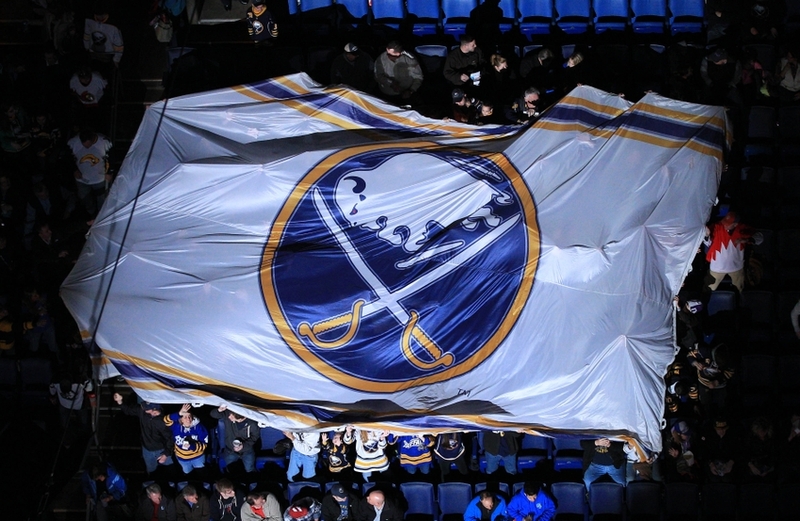 The Sabres are just one of a number of motivating factors in my life, but they are a very real one. In a word: motivation. In their art we see our lives; just look closer at the mirror they dance upon. Serving both as a nightly escape from a weight Atlas barely manages onward to a renewing spirit the Phoenix possess we must be awoke, leave our cave, cast our eyes on the light of a renaissance. A rebirth from within uplifting us to persevere our own trials and tribulations. Their beauty is winter’s rainbow! This entry was posted in Buffalo Sabres and tagged Greek myth, struggle. Bookmark the permalink.